Will fundamentals drive the ethereum price to a new all-time high? Taking a step back, the Crypto markets have largely been shaken by the latest fad. Volume is often shifted liberally based on current trends with buyers looking for the next greatest opportunity to make money, forks being the main driver for these moves. Bitcoin Cash is one such fork, claiming that its fundamentals are in fact better than Bitcoin itself. For the most part it’s hard to argue this, it’s faster and has a lower transaction cost. Vitalik himself on Twitter praised the success of BCH, a move that the community seems very positive towards, for good reason. Bitcoin Cash has served to remind us all that in the long term fundamentals of a coin are important. 12 months after Ethereum was $10 it is important to remember that Ethereum got to its current price of $330 on solid fundamentals, all of which have grown stronger with every passing month. More Ethereum Alliance members get added regularly, and last month an update to the core improved vastly on an already solid foundation. 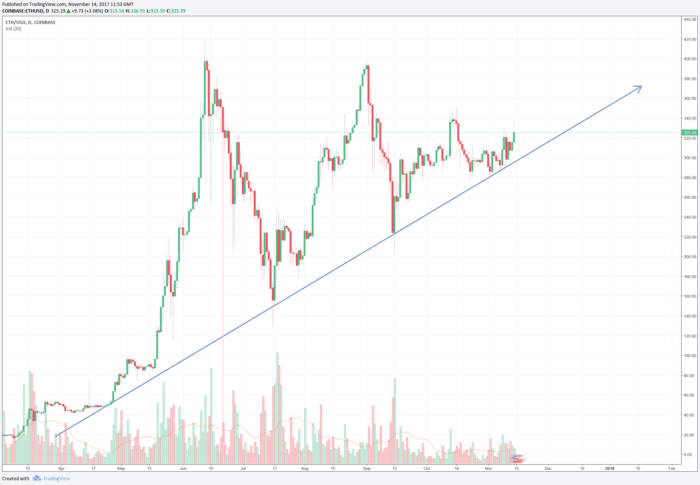 Ethereum looks set for another well-deserved shot in the arm and Bitcoin Cash has proven that the volume potential is there, volume that was driven primarily by fundamentals; something that has taken a back seat to the forks of Bitcoin over the last few months. What is your price Target for Ethereum this month? A journalist that boasts over a decade's experience, in various technological industries. Philip keeps his finger on the pulse in the industry and loves to be the first to hear about the latest developments. Philip can put complicated tech jargon into easy to read content. As the market matures, he hopes to give you the info you need to make the best decisions.